I will go ahead and admit it. I have not ridden Expedition Everest since the big #WDW47 hullabaloo back in June. That was more than three months ago. A hundred days of broken-yeti-free parkeology. Probably a million other people have ridden Everest in that time. And since I’m confessing things, I might as well go one step further. I cannot remember the last time I waited in either the Stand By or the FastPass line for Everest. We did single-rider line during WDW47. And the time before that, I’m pretty sure I was with friends and we did single-rider then as well. What a lonely life I seem to lead, single-ridering my way through Disney’s biggest rides. It would be a good name for an autobiography. The Single Rider. They could make a sappy movie out of it. Katherine Heigl could star. Maybe Gerard Butler also. They could meet cute in the Single Rider line of Everest, fall in love in the Single Rider line of Test Track, have a fight over some misunderstanding in the Single Rider line for Rock-n-Rollercoaster, and then be reunited in the Single Rider line for Soarin’. There you go, Disney. That’s a freebie. And it should make more money than Lone Ranger. This is a roundabout way of saying that the Everest queue has added something since the last time I waited in it. There’s a little room just before the loading station where the Stand By queue does a little switchback dance on the left while the Fast Pass line mirrors them on the right. At some point in the last year (years? ), they added some fun little antiquated slide screens on both sides of this room. These screens are intended to function much like tourist brochures, like the kind you often see in Interstate rest areas or at Medieval Times or at the base camp of the world’s tallest mountain. It’s a bank of four screens, showing posters for local attractions, which rotate every so often by sliding up, as if Gupta or somebody was projecting them from his 1970s area Kodak slide carousel. The posters themselves have the standard Disney puns which are a prerequisite for this type of copy. “Are we there yeti?” and that sort of thing. They are nicely done. My favorite detail is that there are literally animated flies crawling over these projections — exactly as there would be in the Himalayas. There’s not really any point to the posters. Just another layer of detail on top of an already densely layered queue. This last poster caught my eye and tingled my spidey sense. I love it because I’m a fan of anything that remotely relates back to Disney’s pre-High-School-Musical history. 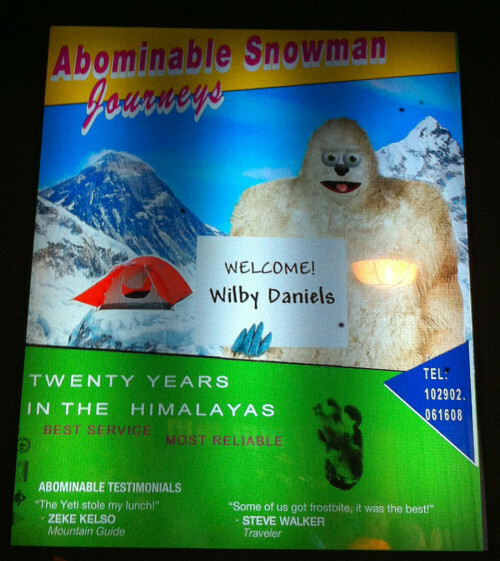 Note the name Wilby Daniels. It’s just unique enough to stand out — and for good reason. Wilby Daniels was the name of Tommy Kirk’s (Disney Legend!) character in the 1959 comedy, The Shaggy Dog. In the movie, Wilby finds a cursed ring which turns him into an enormously fluffy sheepdog. Which is itself only a few steroids away from an enormously fluffy yeti. Wilby Daniels was later played by Dean Jones (Disney Legend!) in the sequel, The Shaggy D.A. in which Wilby grows up to be a lawyer who turns into a sheepdog (not joking). And also by Tim Allen (Disney Legend!) in the 2006 remake, in which the character’s name is inexplicably changed to the boring Dave Douglas. All of these films are decidedly non-art-house fare. It makes me wonder if Expedition Everest: The Legend of the Forbidden Mountain considers itself to be a screwball Disney comedy. It might explain That Darn Yeti Kitty. This entry was posted in Disney Theme Park Hidden Secrets and tagged Expedition Everest. Bookmark the permalink. It looks like somebody went to a retiree’s barber, swept all the clippings into a pile, and then put some googly eyes on it. So no, not creepy at all. On the Yeti Tea poster, Cordelia Drexel Biddle is a Lesley Ann Warren reference (The Happiest Millionaire). Biddle was the author of the book about her father that inspired The Happiest Millionaire. 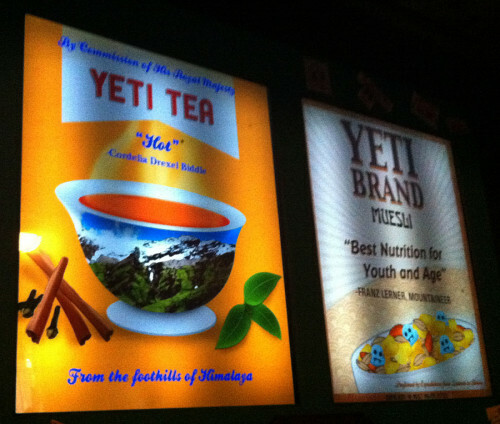 And the Yeti Muesli poster features the Third Man on the Mountain’s Franz Lerner. IMDB says James Donald played that role…and checking his IMDB picture, he apparently was the original Most Interesting Man in the World. They probably had IMDB open in the browser while they were drawing these up! I figured those screens are just a set up for interactive elements with MyMagic+. It’s great that they found ways to put some fun little touches in there too. Nice catch! I completely agree. I realized later that they were probably for the MyMagic+ rollout. Good thinking! Dean Jones played Wilby Daniels in The Shaggy DA…and Steve Walker in Blackbeard’s Ghost…and Zeke Kelso in That Darn Cat! This blew my mind only marginally less than the fact that the names Zeke and Kelso existed prior to 2002. Mark, sorry for the late response. But that is incredible. You get the gold star for catching that. I’m kicking myself for not double checking the names. I consider myself pretty solid on old Disney movies (and can actually quote several scenes in the Shaggy D.A. ), but it’s been way too many years since I’ve seen Blackbeard’s Ghost or That Darn Cat, and the knowledge has faded over time. Excellent work on this one, and it makes me love these screens even more, that they are tributes to Dean Jones’s entire body of work! Shane……. Love your writing, you make me laugh, good job Jerry f.
Thanks Jerry! We try to keep things light around here. They did. They added some scrolling Yeti jokes in the queue. Does that not count? but when are they going to fix the Ytei itself?